In her most recent Jacket2 commentary, Kaia alluded to Slow Poetry. A key instigator of Slow Poetry discussions has been Dale Smith, a poet and writer whose thinking and writing about poetry I’ve admired for a long time. Dale is a poet and rhetorical studies scholar who for a while was based at the University of Texas at Austin. In fall 2011 he will start working at Ryerson University in Toronto. He has been involved with contemporary poetry as a publisher, editor, and writer since the 1990s. 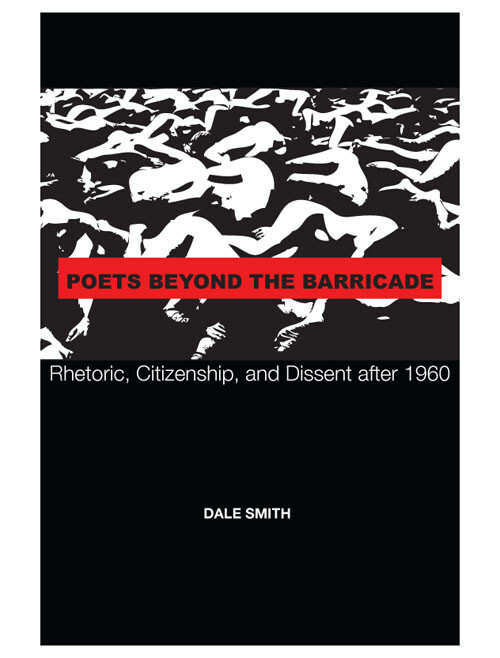 His book, Poets Beyond the Barricade: Rhetoric, Citizenship, and Dissent after 1960 will be published by the University of Alabama Press later this year. I asked him a couple questions about ideas from this book. Allison Cobb is an innovative culture worker who deftly blends rigorous research with a poetic sensibility to create thought-provoking writing. Her interdisciplinary, cross-genre book Green-Wood (Factory School, 2010) is a prime example of her ability to write complex texts that weave together personal narrative, political history, and environmental considerations. 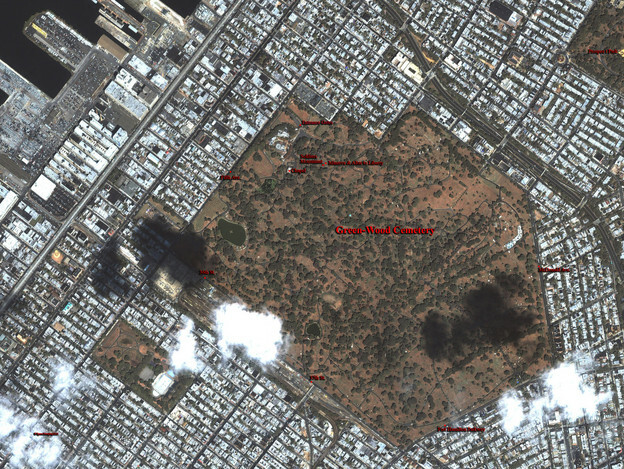 This book draws from scholarly research on the Green-Wood Cemetery in Brooklyn to open up the field of inquiry to wider social processes—such as war, death, and life—and personal experiences—such as attempting to have a child with your partner. This book, which expertly flings socio-political history through the discriminating filter of Cobb’s agile mind, also demonstrates her adeptness at writing both verse and prose. She lives in Portland, Oregon where she is at work on a new book-length project, The Autobiography of Plastic. Recently I had the good fortune of engaging in conversation with Allison about the role walking plays in her work, how space matters, and why she concertedly pushes for the relevance of poetry in the instant-gratification-is-too-damn-slow zeitgeist. What might a poetics of moxie politik look like? Unlike realpolitik's crushing pragmatism and cunning power grabs, a moxie politik might concern itself with exposing, critiquing and challenging concentrated power. A poetics that emphasizes equality, pursued with moxie, pluck in the face of the muck, vim in the place of the grim. Our commentaries will cover the following: Inexpert investigation. Pedestrian poetics. 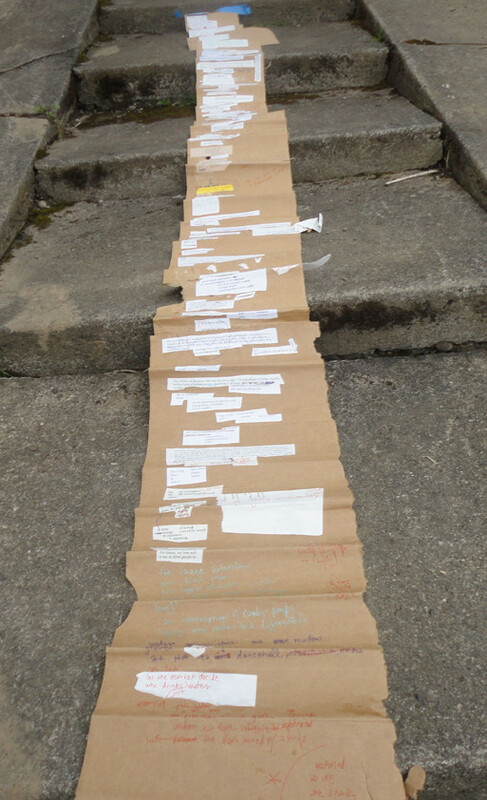 Poetry projects recast for new contexts. Participatory poetry. Poetry as a social practice. Aesthetic spaces translated into activist spaces into aesthetic spaces. Accessibility rethought as 'affording entrance.' Political poetry that is fun, playful and, well, full of moxie. Jules Boykoff is the author of Landscapes of Dissent: Guerrilla Poetry & Public Space (with Kaia Sand)(Palm Press, 2008), Beyond Bullets: The Suppression of Dissent in the United States (AK Press, 2007), and The Suppression of Dissent: How the State and Mass Media Squelch USAmerican Social Movements (Routledge, 2006). He’s also written two books of poetry: Hegemonic Love Potion (Factory School, 2009) and Once Upon a Neoliberal Rocket Badge (Edge Books, 2006). His writing has appeared recently in New Left Review, the Guardian, Oregon Historical Quarterly, the Nation, and CounterPunch. In 2006 he was an invited speaker at the United Nations climate change conference in Nairobi, based on his research and writing on media coverage of climate disruption. In an effort to bring innovative poetry to non-poetry audiences, he serves as poetry editor for Capitalism Nature Socialism. He teaches politics and writing at Pacific University in Oregon. Kaia Sand is the author of Remember to Wave (Tinfish Press 2010) a book that is also a walk Sand leads in North Portland investigating political history and current goings-on. She is the author of the poetry collection interval (Edge Books 2004) and co-author with Jules Boykoff of Landscapes of Dissent (Palm Press 2008). She participates in the Dusie Kollektiv, recently creating a broadside of her embroidered 8-foot dropcloth poem. Last summer, Sand worked on a poetry project through the Oregon Nikkei Legacy Center with people who are homeless in Portland’s former Japantown, exploring histories of the WWII incarceration of Japanese Americans. Sand curates Econ Salons, a format blending economic talks with cultural performances. She recently created the Happy Valley Project, an investigation of housing foreclosures and financial speculation that included a magic show on the financial collapse, A Tale of Magicians Who Puffed Up Money that Lost its Puff.